WASHINGTON - Hillary Clinton, who has frequently described herself on the campaign trail as playing a pivotal role in forging a children's health insurance plan, had little to do with crafting the landmark legislation or ushering it through Congress, according to several lawmakers, staffers, and healthcare advocates involved in the issue. In campaign speeches, Clinton describes the State Children's Health Insurance Program, or SCHIP, as an initiative "I helped to start." Addressing Iowa voters in November, Clinton said, "in 1997, I joined forces with members of Congress and we passed the State Children's Health Insurance Program." Clinton regularly cites the number of children in each state who are covered by the program, and mothers of sick children have appeared at Clinton campaign rallies to thank her. But the Clinton White House, while supportive of the idea of expanding children's health, fought the first SCHIP effort, spearheaded by Senators Edward M. Kennedy, Democrat of Massachusetts, and Orrin G. Hatch, Republican of Utah, because of fears that it would derail a bigger budget bill. And several current and former lawmakers and staff said Hillary Clinton had no role in helping to write the congressional legislation, which grew out of a similar program approved in Massachusetts in 1996. "The White House wasn't for it. We really roughed them up" in trying to get it approved over the Clinton administration's objections, Hatch said in an interview. "She may have done some advocacy [privately] over at the White House, but I'm not aware of it." "I do like her," Hatch said of Hillary Clinton. "We all care about children. But does she deserve credit for SCHIP? No - Teddy does, but she doesn't." Neera Tanden, policy director for the Clinton campaign, said that the senator had "always been pushing for SCHIP" and that the White House had opposed the 1997 Hatch-Kennedy amendment to create the program because President Clinton had made a deal with the then-GOP leadership not to back any amendments to a contentious budget bill. The SCHIP plan - which provides federal matching grants to help states' uninsured children - was to be paid for with a hefty tobacco tax, an idea many Republican and tobacco-state lawmakers opposed. 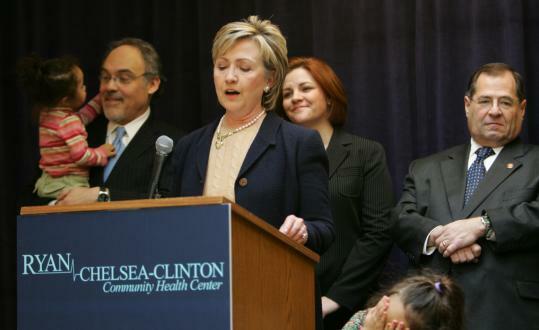 Chris Jennings, who was a Clinton healthcare adviser during her years as the wife of a president, said Clinton had been a longtime and tireless advocate for expanding children's healthcare, and Jennings was baffled by suggestions that she had not been instrumental in getting the plan approved. Jennings noted that SCHIP was indeed adopted, in a second attempt, that same year. "She was very proactive. At every step of the way, she was always pushing" for the concept of expanding healthcare for children, Jennings said. Tanden, the campaign official, suggested that politics were at play in the criticism of Clinton. She noted that Kennedy and others had earlier been complimentary of Clinton's role in SCHIP, but have been more critical since lawmakers started taking sides in the Democratic presidential primary. "Obviously, some things have changed between last fall and now. Some people have endorsed other candidates," Tanden said. Kennedy has endorsed Obama, a move that deeply upset the Clinton campaign. Hatch initially endorsed Mitt Romney for the GOP nomination, then switched to Senator John McCain of Arizona after Romney left the race. Hatch, a longtime Kennedy friend, said he didn't want to criticize Clinton, but felt that the record should be set straight about how the SCHIP program was developed. Asked whether Clinton was exaggerating her role in creating SCHIP, Kennedy, stopped in the hallway as he was entering the chamber to vote, half-shrugged. "Facts are stubborn things," he said, declining to criticize Clinton directly. "I think we ought to stay with the facts." Many members of Congress said they believe Hillary Clinton has a deep and sincere commitment to children's health issues. She has sponsored numerous bills and amendments dealing with a plethora of healthcare matters. But privately, some lawmakers and staff members are fuming over what they see as Clinton's exaggeration of her role in developing SCHIP, including her campaign ads claiming she "helped create" the program. The irritation has grown since Nov. 1, when Clinton - along with fellow senators and presidential candidates Barack Obama, Chris Dodd, and John McCain - missed a Senate vote to extend the SCHIP program, which was approved without the votes of those lawmakers. Kennedy said he patterned the SCHIP plan on a similar program Massachusetts had approved in 1996. Kennedy's account was backed up by two Bay State healthcare advocates who met with Kennedy in Boston to discuss the possibility of taking the idea nationwide: Dr. Barry Zuckerman, director of pediatrics at Boston Medical Center, and John McDonough, then a Democratic state legislator and now the executive director of Health Care for All, a healthcare advocacy group. Kennedy, Zuckerman said in an interview, was intrigued by the idea of using a cigarette tax to pay for children's health, but worried he would not be able to get it through Congress. "I said, 'Times have changed,' and he ran with it," Zuckerman said. McDonough, a Democrat who has not endorsed a presidential candidate, also said it was Kennedy who developed the SCHIP idea after that meeting. "I don't recall any signs of Mrs. Clinton's engagement," McDonough said. "I'm sure she was behind the scenes, engaged in lobbying, but it is demonstrably not the case" that she was driving the effort, he said. After meeting Zuckerman and McDonough, Kennedy sought out Hatch, and the two worked on the bill together, offering it as an amendment to a budget resolution. But President Clinton - much to the surprise and anger of Kennedy - lobbied Democratic lawmakers to oppose the Hatch-Kennedy amendment, the lawmakers and staff members said. Gene Sperling, a former chief economic adviser in the Clinton White House, said the budget resolution never would have passed the House with the Hatch-Kennedy amendment in it. He said that both the president and his wife wanted the SCHIP program and that Hillary Clinton lobbied hard to get it included in subsequent legislation. In fact, the SCHIP program was approved later in the year, a feat Sperling said would not have been possible without the White House negotiating with GOP leaders. And lawmakers in both parties acknowledge that administration support was needed and appreciated. But they said the effort was largely driven by Hatch, Kennedy, and others in Congress. "It was a bipartisan bill. I don't remember the role of the White House," said Representative Henry Waxman, a California Democrat who has not endorsed a candidate in the presidential race and who was the chief Democrat on the Energy and Commerce Committee, which deals with health matters. "It did not originate at the White House."